In his early 30s, aspiring Philly filmmaker Richard Lester hung around American theater and television before expatriating himself to London in hopes of working for his idol, Peter Sellers. There Lester wound up on the cusp of a phenomenon, assigned to direct an exploitation cheapie about the boy-band rage of the moment, a quartet from an English seaport who were taking off in Europe but were, in the then tradition of Brit singing acts, ignored in the States. Of course by the time filming began, no one was ignoring them here, there, or anywhere else. It’s easy to forget, however, what a dubious proposition the Beatles remained for many, who watched them exactly half a century ago this week on TV’s Ed Sullivan Show and assumed that, like so many musical crazes, they would last six months. Six months later this movie (due for a stellar DVD reissue by Criterion this spring) was released. Lester and the Beatles had the mutual good luck of each other, the filmmaker bringing to the enterprise go-for-broke anarchism and the band supplying a sense of the absurd that was finely tuned enough to recall the Marx Brothers. Playing against type the supposedly quiet Beatle, George Harrison, had the movie’s best lines when he wasn’t checking out Pattie Boyd, future muse of George’s “Something” and Eric Clapton’s “Layla,” while perennially cheery Richard Starkey née Ringo Starr was the movie’s most forlorn presence, a Buster Keatonesque sad sack feeling as out of place as the drummer was for real when momentarily he quit the band four years later during the recording of the so-called White Album. Most importantly, of course, Paul McCartney and John Lennon were not just playing against their types but composing against them, while racing into their own as songwriters with the most astute sense of melody since Puccini: Resident balladeer McCartney, besides offering the glistening “And I Love Her,” knocked out the movie’s central rocker, “Can’t Buy Me Love,” while rocker Lennon, besides striking that defining opening chord of the movie’s title song, produced one of the band’s best ballads, “If I Fell.” The album of the same name, their third and the only one at that point to be entirely self-penned, was also the first of the band’s five (six?) (seven?) masterpieces (though released in the States in a botched form). 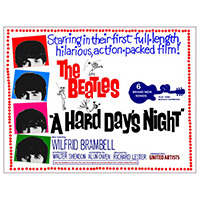 Funny, tuneful, and a vivid document of the century’s most spectacular pop sensation, A Hard Day’s Night is the rare musical that works on every level.